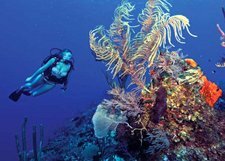 The Eastern Caribbean islands offer some of the world's most famous beaches, resorts, diving and pirate hangouts. 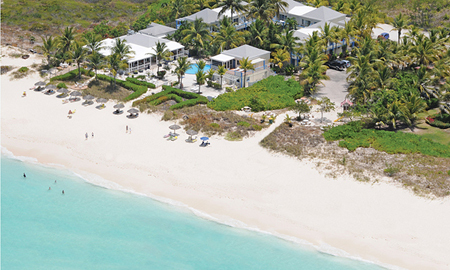 The Turks and Caicos are no exception. We have a great package at the Sibonne Beach Hotel on Grace Bay. Sibonné was the first hotel built on Grace Bay Beach – so it enjoys the best position on the most famous beach in the Caribbean. Renovated and renamed – this is the most intimate hotel on Grace Bay Beach. With only 28 rooms, guests enjoy the distinction of being closer to the beach than anyone staying at the more recent large-scale resort developments on Grace Bay. Add to this – the glorious view from our restaurant, Bay Bistro – where you look directly at the beach and the aqua-blue waters of Grace Bay. 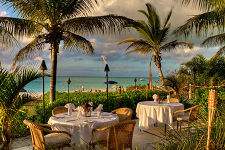 Bay Bistro is one of the few restaurants on Grace Bay that offers fine dining with a beach front location and full ocean view from their dining room. As soon as you step onto your balcony, dine in the oceanfront restaurant, walk onto the powdery white sand, or swim in the amazingly clear turquoise water of Grace Bay Beach – you’ll understand why Sibonné Beach Hotel is the best choice for your Caribbean vacation in the Turks & Caicos Islands. Add to this, fantastic dive sites and an amazing accommodation and dive package with the Ocean Vibes dive team. Our 7 night package with accommodations and 5 dive days is $1,381 per person double occupancy European Plan (no meals). 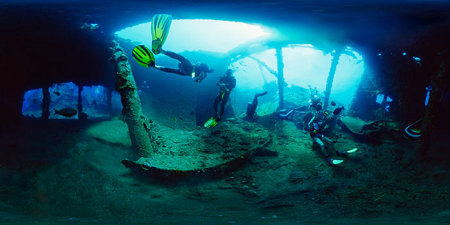 Dive services provided by Ocean Vibes.